Legendary salsa singer Celia Cruz has died at her home in New Jersey at the age of 78. The Cuban-born perfomer died of a brain tumour at her home in Fort Lee, surrounded by family and friends, after undergoing surgery for the condition late last year. Known as the Queen of Salsa and considered the most influential woman in the history of Afro-Cuban music, she is credited with bringing salsa to a wide audience, notably through her collaboration with Tito Puente, one of the stars of Latin music in the US. Dominican composer Rafael Solano said that an artist of Cruz's standing "come to the world only once every 200 years" and that "we must all express our sadness at her passing". 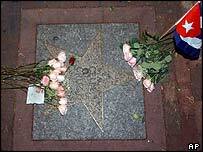 Cruz's death comes three days after another prominent Cuban musician, Compay Segundo, died in Havana at the age of 95. According to media reports, Cruz's body will be taken to Miami where she will be mourned by the 700,000-strong Cuban exile community. Latin actor Edward James Olmos dedicated the Los Angeles Latino Film Festival to the life of Cruz on is opening day on Wednesday. "During these 16 days we will celebrate her life and her music," he said. "She was a great lady and she was one of the greatest artists of the past century and probably of this one." Fernando Osorio, composer of one of her greatest hits La Negra Tiene Un Tumbao - The Black Woman Knows How to Move - said "she has earned her right to rest". 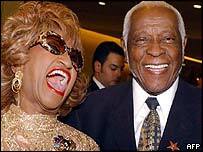 Celia Cruz recorded over 70 albums and featured in many films, including The Mambo Kings in 1992. 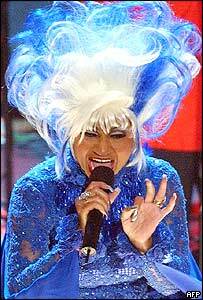 Aside from her vocal talent, she was known for her outrageous costumes, wild wigs and energetic stage persona, as well as her trademark cry of "azucar" - "sugar". She received several Grammys for her work, collecting her fifth in February 2003 for best salsa recording, and was also honoured in 1995 with the Billboard Lifetime Achievement Award. In 1994, she was presented with the National Medal of Arts, the highest US official honour, by the then-president Bill Clinton. Cruz attended a concert evening in her honour in March in Los Angeles featuring some of the biggest names in US and Latin music, including Jose Feliciano, Gloria Estefan and Gloria Gaynor. Born in 1924, Celia Cruz studied at the Conservatory of Music in Havana. She then sang on Cuban radio programmes and, in 1950, became the lead singer of the legendary Sonora Matancera. But along with her band Cruz left Cuba shortly before Fidel Castro took power in 1959, and was never allowed to return to her homeland. "Castro never forgave me," she said. In 1962, she married Pedro Knight, a trumpeter in Sonora Matancera. He was by her side when she passed away on Wednesday. A tribute from the Recording Academy and the Latin Recording Academy - which organise the Grammys and Latin Grammys - said: "Her colourful spirit, uplifting music and inspiring passion will live on forever." "Celia Cruz was often billed as Cuba's answer to Shirley Bassey"